← SHE SPEAKS…BUT WHO LISTENS? On March 2, 2011, the Supreme Court ruled that members of a fundamentalist church (Westboro Baptist) have a right to protest at military funerals. Westboro Baptist, led by Pastor Fred Phelps, is not protesting the war as much as supporting his church’s religious belief that the war is punishing America for the government’s tolerance of homosexuals. Phelps founded the small church in Topeka, Kansas in 1955. The congregation is made up of around 70 some followers, mostly Phelps’ relatives. 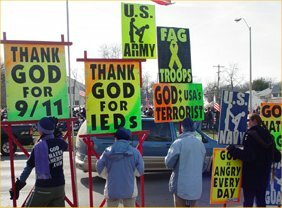 In 2006, Albert Snyder sued Westboro r after members showed up carrying signs that read, “Thank God for dead soldiers.” and “God hates you!” at his son’s funeral in Westminster, MD. 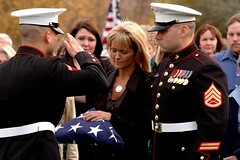 Snyder’s son was a Marine killed in Iraq. The ruling passed the Supreme Court by and 8-1 measure with only Judge Samuel Alito dissenting. But this isn’t so much about judges or churches as it is about practicing what you preach and the voodoo made up interpretation of the Bible that many “churches” use when wanting to promote their own agendas. Voodoo interpretations like the ones Westboro Baptist believes. 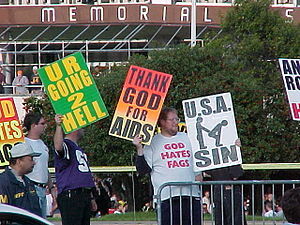 If Westboro Baptist supports signs which read, “God Hates You!”, they have profoundly dissented from biblical perspective. God does not hate anyone. He made all people in His image and while certain behaviors may not be condoned, God is not about hate for any of His children. In addition, the Bible tells us to “love our enemies and to pray for those who persecute you. (Matthew 5:44). What type of love or even “God Like” behavior is demonstrated by protesting at a funeral of a soldier whose death may have been the result of fighting to keep the freedoms the protesters have ,like freedom of speech or religion alive? If you want to protest about America’s values, go protest in front of the Capitol building or any number of other government places but targeting innocent victims is almost like having a hate crime agenda of your own just for getting more publicity. Many individuals seek to serve in the armed forces to help defray the costs of higher education or to seek to earn a living by giving back to society and not just living off of society when they are unable to find other employment. For whatever reason, protesting at a military funeral is simply a selfish display of how to speak your mind when others’ emotions have been compromised by a tragic and untimely event. I believe in freedom of speech as much as anyone but my message to Westboro Baptist Church and Pastor Phelps is to really read the bible, especially 1 John 4:20-24″ If anyone says, “I love God” but hates his brother, he is a liar.” You may have a right to think what you think and even say what you say, but that doesn’t make you right. To stoop so low as to need to get your message out by playing on the unfortunate events of families who have lost loved ones only shows how little regard you have for those made in the image of Christ. It’s not for me to judge Westboro Baptist but I think they have forgotten whose job judgement really is and that is simply dangerous! This entry was posted in Uncategorized and tagged Issues Facing Christians and More. Bookmark the permalink. 1 Response to God Hates You!